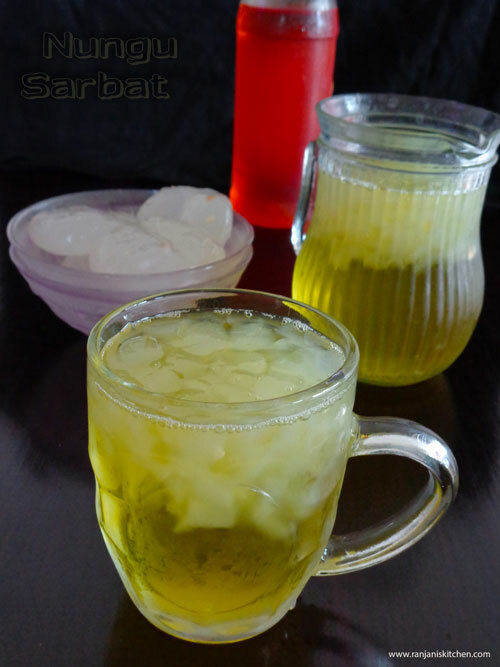 Nungu Sarbat Recipe – Super coolant with nannari flavor. Nungu also called as palm fruit or ice apple. It is good to have as it is. If we add different flavours it will make the drink more interesting. So i did the way with nannari syrup. I have already tried nungu rosemilk. Its easy and super tasty one. So if we add nungu to anything, it blends to its taste. It has lots of Nutritional benefits. It keeps the body cool and prevents indigestion. The potassium present in this fruit eliminate toxins from body. The water presen in this fruit is used to treat for skin allergies during summer. Do not store this fruit for more than a day. Peel nungu skin, chop into small pieces and keep aside. Add nungu syrup, water and sugar in it. Squeeze some lemon juice in it and mix well. Chop or crush palm fruit(Nungu). Mix nannari syrup on crushed nungu. Add water, sugar and lemon in it. Mix well and serve in glasses. Nice combo two coolant together !!! Such a cute name. Would like to try this palm fruit drink.